We obviously could not do what we do without the food that we receive from the six different Marin County-based grocery markets, and other food vendors who give us food to distribute—mostly on a daily basis. If you are with a store that still throws away food, please take note of the above graphic from the Environmental Protection Agency that makes a point that the MOST PREFERRED method of disposing of still edible food is to FEED HUNGRY PEOPLE. Where does the food Respecting Our Elders delivers come from? It comes from local grocers and food purveyors. 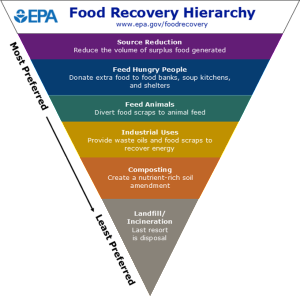 Essentially, the food that is donated would otherwise be thrown away, and therefore could be considered “spoils” or “garbage.” However, in actuality, it is for the most part, fresh food that has reached—or is about to reach—it’s expiration date, or is too ripe to sell, or the package was damaged in some way. Instead of throwing it away, these stores donate it and it is immediately distributed to people who can use it, who cannot afford to go out and buy this food on a regular basis. How does this benefit the donating stores? First is the good public relations in the community for the donating store when it becomes known that they are donating to Respecting Our Elders. The public likes to support stores that are truly community-minded. Respecting Our Elders has a very beneficial and positive reputation in Marin County for helping those in need. Second, it saves the store money in daily dumpster fees that usually range in the hundreds of dollars per dumpster. This is a bottom line that cannot be ignored. And certainly last but not least, we have heard that people who have received food through Respecting Our Elders have turned around and gone shopping at the donating stores, using their limited funds or food stamps to buy things that they have found out about through this distribution program. This is another bottom line benefit to the donating vendor. How are the stores that donate food to Respecting Our Elders protected?